C'mon, lets not get carried away, after all, he was a man of "integrity" not to long ago. They should probably have the inside of that plane Hazmat cleaned. Well I stand corrected.. With that many indictments he would have made a perfect candidate for President on the Democrat ticket. First, they need to remove Stormy's knee pads. Rumor has it there's a pair under every passenger seat. 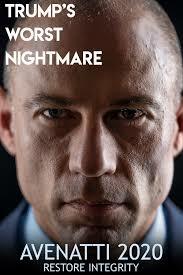 Those are actually all Avenatti's knee pads... bizarre, but seemingly true. Super-reptile Bill Maher and his army of sycophants sure adored him. Haven't like five of Trumps advisors gone to prison already? It's both sides. They're all scumbags. Ahahahaha! Too funny. I wonder how it feels knowing you called this guy "integrity" not long ago, and now he's facing criminal charges. Or do the left push this aside like they did Jonathan Gruber and pretend they never knew him?